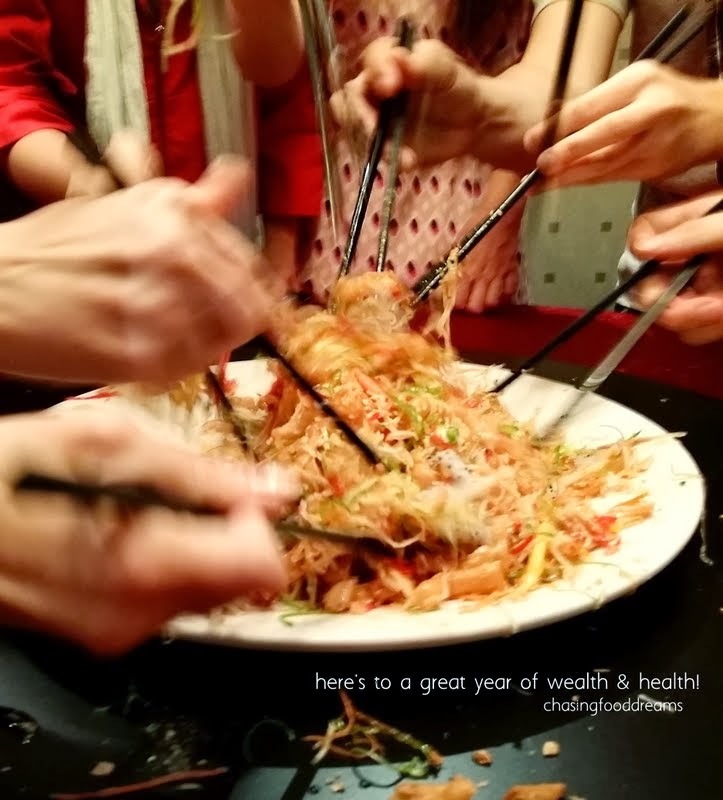 CHASING FOOD DREAMS: Si Chuan Dou Hua, PARKROYAL KUALA LUMPUR: Ushering in Prosperity of the Horse! Si Chuan Dou Hua, PARKROYAL KUALA LUMPUR: Ushering in Prosperity of the Horse! My first toss for the year, we are back at Si Chuan Dou Hua at PARKROYAL Kuala Lumpur for a taste of this year’s Chinese New Year set course. No stranger to this restaurant, Si Chuan Dou Hua serves fine Szechuan cuisine for those who love the pungent flavors of chili and garlic. 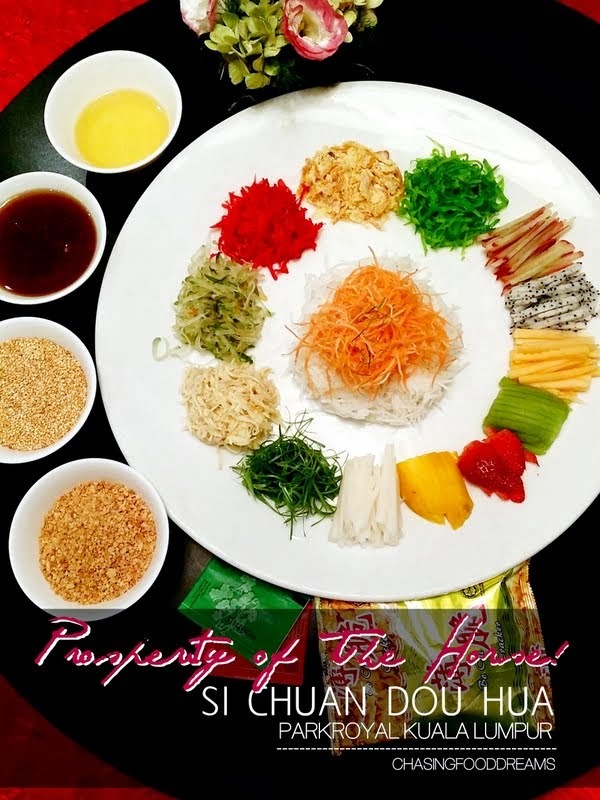 Ushering in the Properity of the Horse, Si Chuan Dou Hua has specially crafted six set menus to ring in prosperity, wealth and good health of deliciousness. From 13 January to 14 February, Chinese Sous Chef Sim Nin Looi and his team has whipped up a bountiful feast of dishes from luscious Yee Sangs to velvety soups and a lavish array of seafood treasures and meat delights. We got together with the foodie gang to get a taste of the dishes from the six set menus one evening. Another significant sign of Chinese traditions of wealth is Braised Coral Shark’s Fin with Crab Meat, Bamboo Pith & Dried Scallop. I enjoyed the broth a lot as it had a great essence of a well-made broth and tinged with sweetness from crab meat and dried scallops. Shark’s fin and julienned bamboo pith added texture. A personal note, the soup is just as good without the shark fins, so if you do not take them, do let the restaurant know. The star of the night had to be the Deep Fried Cod Fish with Pomelo Sauce. It was an applause around our table as we bite into crispy and juicy sweet cod dressed in a lightly sweeten pomelo with plum sauce. Sacs of pomelo burst with freshness together with pickled red onions together with some sprouts, making the cod a great stand out dish. We love the flavors and textures of the dish and felt it makes a great CNY dish because of the fish and the pomelo. A must-have if my books! Creamy, a little heat, buttery and sweet sums up the luscious Sauteed Fresh Water Prawns with Butter & Cornflakes. The prawns have a nice bouncy firm bite while the bits of crushed cornflakes add crispiness. A plate of cholesterol laden crustaceans but so worthy in every bite. Make sure to eat them as prawns signify lots of laughter for the New Year. Noodles are great for longevity so Sichuan Dan Dan Noodles with Scallop makes a nice change from the usual rice dish. The minced meat sauce is flavorful enough with a nice heat while scallop added the luxury factor to the dish. Ending on a sweet note, Steamed Nian Gao with Coconut Flakes proves that classic reign supreme. 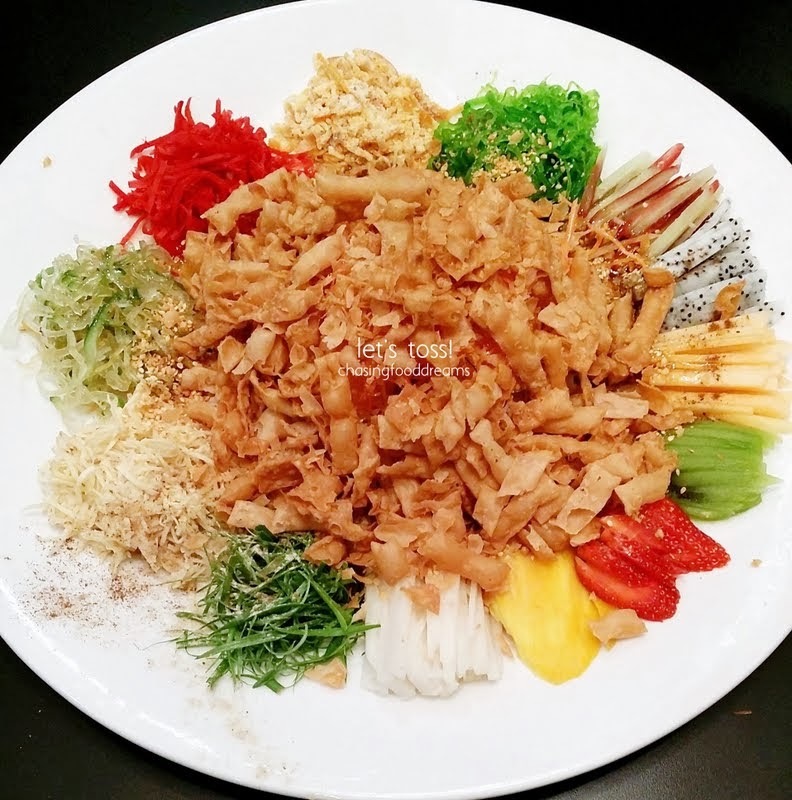 There are plenty of Yee Sang options for dine-in or take away such as Abalone, Shark’s Fin, Tuna, Soft Shell Crab, Salmon, Jellyfish, Scallop Skirt and Pacific Clam that are specially concocted with sauces like Sour Plum with fruit, Spicy Plum Sauce with Mango or the traditional Sour Plum Sauce. Priced from RM56nett (half portion) and RM103 nett (full portion) onwards. Missing nian gao.. feel like eating it again soon! Oh no! Some people will not be very happy with that sharks' fins dish. The prawns look soooo good! I love the prawns and the fish! The yee sang looks lovely, but I'm FINIshed with FINS!